Ali and I were back to tackle our 7th Peaks Challenge Falls Creek in a row. This year, like previous years, the weather was perfect. Along with our friend, Nadine, we were the 10 Hour Ride Leaders. 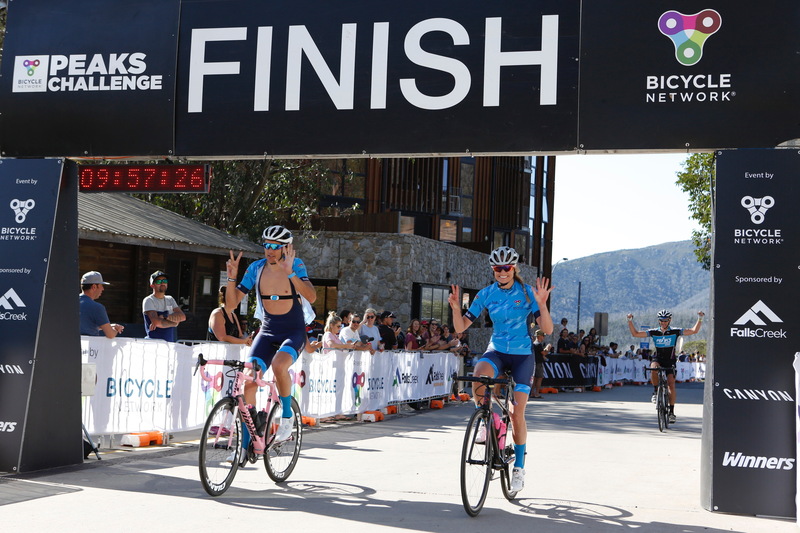 Peaks Challenge Falls Creek is the best challenge ride on the calendar and it’s no surprise why it is in the Top 10 rides in the world!! It’s beautiful, it’s tough, it’s rewarding and it can break you. It was great to see so many SKCC jerseys out on course and many familiar faces from the SKCC family. We arrived on the Friday night and stayed in a big Lodge with a heap of friends. On the Saturday we went for a little 10km ride to wake the legs up and then we enjoyed the happenings at the event village on top of Falls Creek. We attended the 6pm ride briefing then headed back to the Lodge for a big dinner then off to bed. Every year when I am climbing the back of Falls after already riding 200kms I swear I will never do it again but within five minutes of crossing the finishing line to all the cheers and smiling faces I’m like; sign me up for next year. There is nothing in your training that can prepare you for the back of Falls. Once you hit WTF corner it’s all mental. It’s like a warzone out there. People are cramping and groaning, people are walking and some people are beaten. It’s here where you just have to keep on going because there is no better feeling than crossing the finishing line and seeing the joy and satisfaction knowing you have successfully completed this monster of a ride. Not everyone can say they have ridden 235kms and climbed 4500 metres! I never felt good from the first kilometre so I knew I was in for a long day, but like Ali, our job is to help people come in under their 10 hour goal. No matter how bad we are feeling we have to keep going. We made our time with 10 mins to spare and met some great people along the way. The comradeship and bonds that a formed in the tough times out on course stay with you for a very long time. We met some really incredible people and everyone has their own story or own reason for doing it. It is such a well-run event, everything runs like clockwork and it’s a credit to Bicycle Network and their band of friendly volunteers. Do yourself a favour and sign up for next year’s event. Set it as a goal and get some friends to do it as well. It’s such a great weekend away and it will give you something to train for over the summer.